Born in Vevey, Switzerland, Thabo Sefolosha fits right in with his fellow cast of characters on the Oklahoma City Thunder, whose athleticism and ability to run have enabled their young squad to rank among the best in the competitive West. A role player who has been key to the Thunder’s success, Sefolosha joined superstar Kevin Durant and starting center Nenad Krstic on the cover of Sports Illustrated’s 2010-11 NBA Preview. He’s a long, athletic player who prides himself on playing aggressive team D. Sefolosha hustles, gets stops and rebounds the ball, doing his part to refute foreign players’ reputations for being soft on defense. Now entering his fifth NBA season, his third with OKC, we may not have seen how complete a player he is yet. Sefolosha is a raw talent who, depending on how hard he works, could develop into something interesting as he matures and gets more experience in the league. He will continue to get better as he rounds out his game. Sefolosha posted double-doubles in two of his past four contests – going for 13 points and 11 rebounds against the Wolves followed by 13 points and 10 rebounds against the Pacers last week. 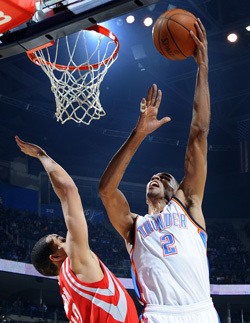 A multiple-position player, Sefolosha is averaging about 6 points and 5 rebounds in 30 minutes per game. He’ll get you a couple assists, a steal and even the occasional block. He’s available in most fantasy leagues, and Oklahoma City plays 4 games this week. Pretty good post. I just came upon your website and wanted to point out that I’ve genuinely enjoyed browsing your weblog posts. I’ll sign up for your feed and I hope you publish another post again soon!